Itchmo: News For Dogs & Cats » Blog Archive » Oh Please, Pretty Please, Can We Give Away The Dog? Oh Please, Pretty Please, Can We Give Away The Dog? Or am I doing the disco? This entry was posted on Friday, June 15th, 2007 at 11:00 am	and is filed under Funny Cats & Dogs, Cats, National Dog, Cat & Pet Info. You can follow any responses to this entry through the RSS 2.0 feed. Both comments and pings are currently closed. Excellent caption. Thanks for bringing smiles to this site today! Job well done! LOL! My cats want to give away their dog too, but it is more of a demand that a sugar covered request. 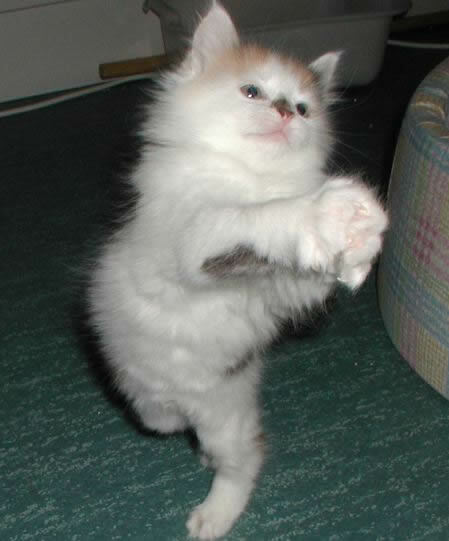 Looks like he/she is doing the Macarena Dance! What an awesome picture! great caption…really made me laugh and think of my brood! Haha! This is exactly what all three of my cats are thinking! Pictures like this make me wanna get some kittens………I’m a dog owner. LOL.. That is how they get you! Those evil cats. Oh SO CUTE but Oh SO EVIL! ( I have 5 ;) ). well T, take it from someone who knows, it IS possible to be a dog owner & a cat owner (or as my name suggests, a dog slave & a cat slave) at the same time! there are plenty out there to go around..
No Petslave, I am allergic to animals, cats more so, so in the past I had to avoid them. our cats were always in complete control of any dog we had- so the dog ended up being the bumbling minion to Master Kitty. hey, that sounds like my position vis a vis my cats. Looks like my cat when she sees her raw chicken breast breakfast coming! Awwwwwww! That is the cutest picture of a kitten that I’ve ever seen!